360 Marlborough is located on the south side of Marlborough, between Gloucester and Hereford, with 358 Marlborough to the east and 362 Marlborough to the west. 360 Marlborough was built in 1879-1880 by Vinal & Dodge, masons, for building contractor George Wheatland, Jr., one of eight contiguous houses (348-350-352-354-356-358-360-362 Marlborough) built in 1878-1880 for him. Click here for an index to the deeds for 360 Marlborough. 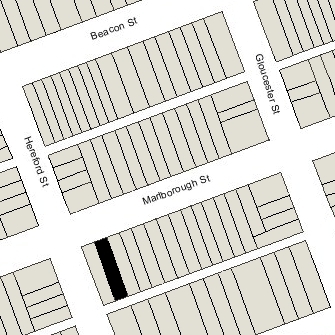 George Wheatland, Jr., subdivided the property into eight lots, seven with 23 foot frontages and the eighth, at the corner of Hereford, with a 24 foot frontage. He built houses on the lots at 348-362 Marlborough, each of the same design, with the entrance on the left and a bay on the right. On May 27, 1880, 360 Marlborough was purchased from George Wheatland, Sr., by Mrs. Susan Barnes (Cushing) Lincoln, the widow of merchant William Shattuck Lincoln. Her sister, Mrs. Helen Elizabeth (Cushing) Baylies Tracy, the widow of Nicholas Baylies and of former Boston City Treasurer Frederic Uriah Tracy, lived with her. They previously had lived at 325 Beacon. By 1890, they had been joined at 360 Marlborough by William Lincoln Smith, the grandson of Susan Lincoln’s husband by his first marriage (to Elizabeth Whitney). He was an electrical engineer. He married in June of 1894 to Grace Blanchard and they made their home in Concord. Susan Lincoln died in September of 1900 in Concord. Helen Tracy continued to live at 360 Marlborough in 1901, but moved soon thereafter. 360 Marlborough was inherited from Susan Lincoln by William Lincoln Smith, and he and his wife lived there during the 1901-1902 winter season. Their primary residence remained in Concord. On August 1, 1902, 360 Marlborough was acquired from William Smith by George Whitefield Chadwick. He and his wife, Ida (Brooks) Chadwick, made it their home. They previously had lived at 903 Boylston. They also maintained a home on Martha’s Vineyard. George Chadwick was a musician and composer, and was Director of the New England Conservatory of Music. During the 1905-1906 winter season, the Chadwicks were living elsewhere and 360 Marlborough was the home of Charles Stetson, a lawyer, and his mother, Annie S. (Sawyer) Stetson, the widow of Charles Pierce Stetson. They previously had lived at 439 Marlborough. By the next season, they had moved to 501 Beacon and the Chadwicks had resumed living at 360 Marlborough. The Chadwicks’ sons, Theodore and Noel Chadwick, lived with them. Noel Chadwick married in July of 1919 to Elizabeth H. Young; after their marriage, they lived in Brookline. Theodore Chadwick married in June of 1922 to Elizabeth Zerrahn; after their marriage, they lived in an apartment at 261 Beacon and later in Dedham. On May 1, 1922, George Chadwick transferred 360 Marlborough into his wife’s name. George Chadwick died in April of 1931. 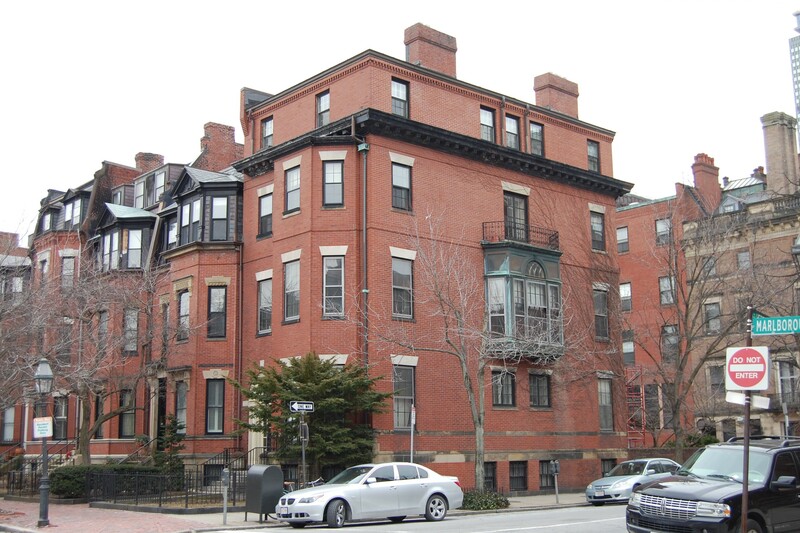 Ida Chadwick continued to live at 360 Marlborough until her death in October of 1936. 360 Marlborough was shown as vacant in the 1937 City Directory. On January 14, 1937, 360 Marlborough was purchased from Ida Chadwick’s estate by Shirley Clifford Speed. On February 1, 1937, S. Clifford Speed transferred a one-half undivided interest in 360 Marlborough to Mabel Welsh. On June 3, 1937, 360 Marlborough was acquired from S. Clifford Speed and Mabel Walsh by Dr. M. Luise Diez. Dr. Diez was director of the Division of Child Hygiene of the Massachusetts Department of Health, and was a nationally-recognized expert on child hygiene and obstetrics. She was unmarried. She continued to live at 360 Marlborough until her death in April of 1942. On July 23, 1942, 360 Marlborough was acquired from M. Luise Diez’s estate by Charles Borden Messenger. He and his wife, Helene Bernice (Durling) Messenger, made it their home. Charles Messenger was an investment counselor with the American Institute of Finance. They continued to live at 360 Marlborough until about 1952. On February 6, 1952, 360 Marlborough was acquired from Charles Messenger by Basil G. Calevras, Consul for Greece, and his wife, Danae Calevras. They continued to live there in 1954. By 1955, 360 Marlborough was the home Lyman H. Butterfield and his wife, Elizabeth A. (Eaton) Butterfield. They leased the house from Basil Calevras. Lyman Butterfield was an historian with the Massachusetts Historical Society, noted for his work as editor of the Adams family papers. Before moving to 360 Marlborough, he had been director of the Institute of Early American History and Culture at Williamsburg, Virginia. The Butterfields continued to live at 360 Marlborough until about 1958. By 1959, 360 Marlborough was the home of Mrs. Thelma B. Hatch, who leased it from Basil Calevras and operated it as a lodging house. She previously had lived in Marshfield. In January of 1959, the Building Department cited Basil Calevras for insufficient egress. He claimed diplomatic immunity and refused to correct the deficiencies. In 1960, Mrs. Hatch undertook to acquire the property and, in conjunction therewith, in January of 1960, the 232 Realty Trust filed for (and subsequently received) permission to legalize the occupancy as a single-family dwelling and lodging house. Mrs. Hatch did not complete the purchase of 360 Marlborough, and on July 12, 1960, Dean Harry Demeter and his wife, Denise D. (Voultos) Demeter, acquired it from Basil and Danae Calevras, then residents of Paris. Dean Demeter was night manager of the Lenore Hotel, and later would become manager of the Lenox Hotel at 61 Exeter. In December of 1960, Dean Demeter filed for (and subsequently received) permission to convert the property from a single-family dwelling and lodging house into three apartments. He and his wife occupied one of the apartments. On February 1, 1983, and again on June 28, 1995, Dean and Denise Demeter transferred a partial interest in the property to their children, Anthe Joy Demeter and Harry D. Demeter. Dean Demeter died in December of 1999. On October 5, 2001, Robert Murray Lynyak and his wife, Barbara Ann (Bamford) Lynyak, purchased 360 Marlborough from the Demeter family. 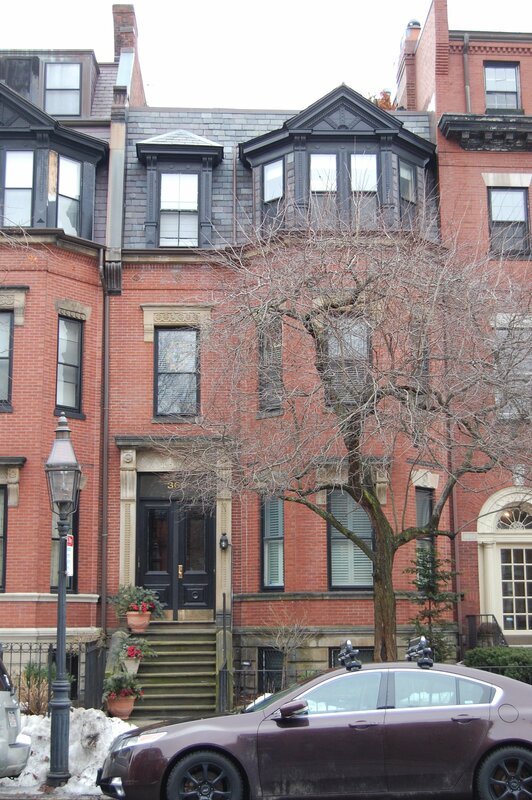 On November 15, 2002, they converted 360 Marlborough into three condominium units, the 360 Marlborough Street Condominium.